Here we define the terms that we will use across this document. "You" or "User”: A person or an entity. If you use the services on behalf of an employer or organization, you agree that you are authorized to accept these Terms on behalf of your employer or organization. "You" or "User” will refer to that organization in such case. "MY Account" or “Services”: An account and online services at capturingreality.com owned and controlled by CR. These terms are a legally binding agreement between you and CR. The terms are related to you and your use of MY Account. Read these terms carefully. If you do not agree to be legally bound by all of the following terms, then please do not access and/or use MY Account. If we apply any material changes to these Terms of Service/Use, you will be notified by our post on the website, or by an informatory email, unless you have ‘unsubscribed’ from our Newsletter. This will be executed prior to the change becoming effective. We, however, encourage you to periodically review this page for the most up-to-date information. MY Account provides access to the products and services provided by CR. We require from you and store following information for registration and use of MY Account: your e-mail address, full name, address, company, phone, web-site, and country. You are responsible for: maintaining the security of MY Account and password, and any activity related to the use of your MY Account (authorized or not). CR shall not be liable for any loss or damage resulting from your failure to comply with these obligations. If your MY Account is attacked, compromised and/or abused then you should immediately notify the provider. CR shall not be liable for any loss or damage resulting from abovementioned events. You have the right for correction or deletion of all information related to your person by editing or deleting your MY account or by sending an email request to privacy@capturingreality.com and specifying which information about your person you are requesting to correct or remove. Please note that this may affect how much of the website you will be able to access. We also require to keep certain information in order to keep your MY account active, that is a requirement for use of our software product by you. The following personal information is required to maintain your MY account: your email address and password hash. You agree not to post any abusive, obscene, vulgar, slanderous, hateful, threatening, sexually explicit or any other material that may violate any laws be it of your country, the country where any CR website is hosted or International Law. Doing so may lead to you being immediately and permanently banned, with notification of your Internet Service Provider if deemed required by us. IP addresses of all posts are recorded to aid in enforcing these conditions. You agree that CR has the right to remove, edit, move, close or put on moderation queue any topic at any time we see it based on the site wide rules as well as forum specific rules (published within the specific forums). Please note that currently any very first post is automatically placed in the moderation queue and will be approved/disapproved according to the site wide rules. As a user you agree to any information you have entered to being stored in our database. While this information will not be disclosed to any third party without your consent, CR shall not be held responsible for any hacking attempt that may lead to the data being compromised. CR owns or can exercise copyright to all the software available at MY Account sites (hereinafter referred to as "Software") and all official CR pages. The Software is supplied together with the end-user license agreement ( hereinafter referred to as "EULA" ). User MUST agree the EULA in order to be able to use and install the software. End-users are allowed to use the software only in accordance with the EULA. You agree not to modify, rent, lease, loan, sell, assign, reproduce, distribute, license, sublicense, reverse engineer, spread the software except as authorized in the EULA. It is prohibited by law. If you break the EULA, you risk civil and criminal penalties and a litigation, in which CR will demand adequate compensation and remedy for the legal rights violation. The Software, all accompanying files, data and materials, are distributed "AS IS" and with no warranties of any kind, whether express or implied. The user must assume all risk of using the software. You hereby acknowledge that MY Account is provided "AS IS" and with no warranties of any kind, whether expressed or implied (to the maximum extent permitted by applicable law). The user must assume all responsibilities and risk of using MY Account. CR and the copyright holders make any warranties whether express or implied (to the maximum extent permitted by applicable law). CR makes no guarantees (on features, services, content correctness, errorless operations, etc.) related to MY Account (to the maximum extent permitted by applicable law). In no event shall CR or its principals, shareholders, officers, employees, affiliates, contractors, subsidiaries, or parent organizations, be liable for any incidental, consequential, punitive or any other damages whatsoever relating to the use of MY Account (to the maximum extent permitted by applicable law). Any liability of CR or its principals, shareholders, officers, employees, affiliates, contractors, subsidiaries, or parent organizations will be limited exclusively to refund the sum you had paid to the provider. All notices must be in the written form and must be delivered by mail to: Capturing Reality s r. o., Syslia 46, 821 05 Bratislava SLOVAK REPUBLIC. In order to secure correct and smooth functioning of this webpage, we save small text files called cookies on your devices during browsing this web. They contain information on some of your steps and preferences especially for repeated use of our webpage. By ‘providing a license’ is understood a paid granting of the non-exclusive and time-limited (time-unlimited / perpetual) right from the provider to user for the use of a selected software. 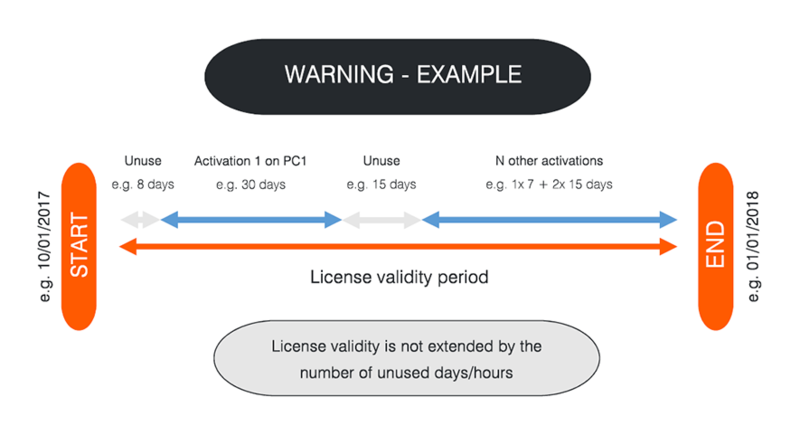 A license is valid for a fixed period of time. The period is defined by a fixed starting and ending date. The starting date is typically identical to the payment date or it can be agreed case-to-case. The ending date is minimally set to +10 years in case of time-unlimited (i.e. perpetual) license. However, in such case, we will create another (long-time) license after that period of time if the owner of the perpetual license asks for it. The license is always associated with MY Account. The list of all licenses can be found in the Licenses section of MY Account. The license owner is the user who owns MY Account. The license can be bought by another person or entity through the user's MY Account. An invoice is issued to the buyer (not to the owner) and can be issued by another legal entity than the provider. In such case the payment process MUST be initiated from user's MY Account. Nevertheless, the license is always created once the license fee has been paid. The invoice for each license is accessible through Invoices section of MY Account. The software requires an online (offline) license activation for a set period of time in order to function on a specific computer. The license is registered to a customer (end user) who owns the linked user account to whom the taxation document (invoice) had been issued. 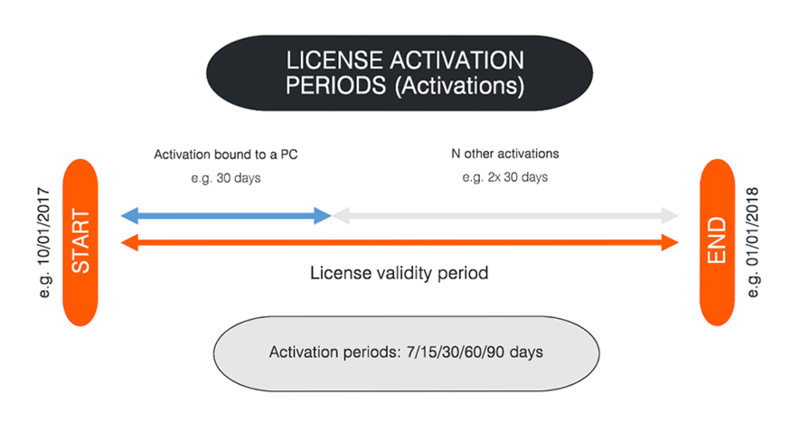 The license activation gives the customer the permission to use the software on a single computer during the given period of time, without the possibility to change the computer. The license is accessible after logging in in the user profile at https://www.capturingreality.com/My, in the Licenses section. 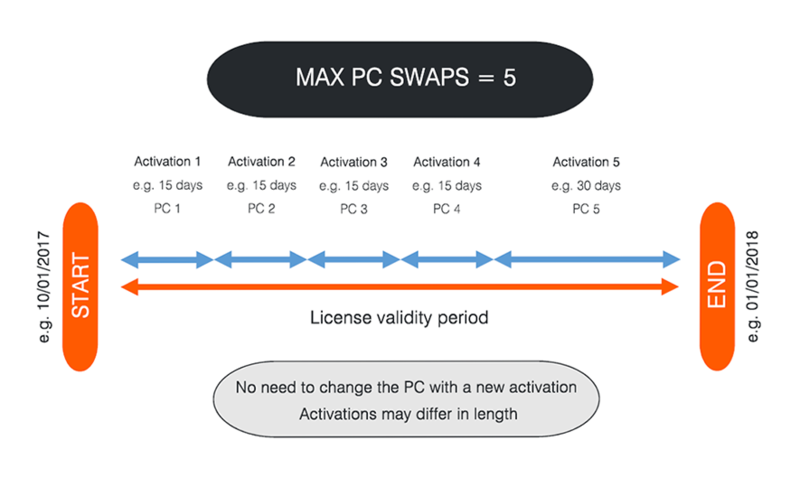 After license activation expiring, there is a possibility to activate the license on a different PC. The change of a computer is allowed 5 times per year. It is possible that during the online registration the customer’s hardware description data (or other non-personal data) will be transferred to a server of the company and that the customer may be appealed for presenting further private information. By activating the product the customer gives consent to their storing. One of the conditions for providing the license is also a given consent to the license contract conditions (agreement on software license provision – so-called End User License Agreement / EULA) which is given to a customer during the software installation. If a customer disagrees with the agreement version about the software license provision (EULA), they should immediately interrupt the software installation process and further proceed in accordance with the article VII. of these business conditions (contract withdrawal). The license is activated directly through the software during its first run. The program will prompt the user to acquire a license activation key online. The user has the possibility to turn on the automatic license extension. This can be changed later in the application settings. It is necessary to enter the login data used for the user’s account created at https://www.capturingreality.com/My. After logging in you select the activation period and confirm the provided data. In case of choosing the offline activation it is required to save the application unlock file to a portable medium and log in online to https://www.capturingreality.com/My. Afterwards, activate the PC in the license section via the above-mentioned file and import the license key file. This clause describes support that is included in a license price ( e.g. RealityCapture CLI or RealityCapture ). If a license does not contain support ( e.g. RealityCapture Demo or RealityCapture Promo ), then its user can use our web forum instead. CR shall have the technical expertise in their performance of technical support. A request for support can be sent by e-mail or e-ticket. These should be answered within 1-3 working days. Our working days are from 8.00 a.m. until 4.00 p.m. CET. By working days are meant all days that are neither Saturdays, Sundays or public holidays, nor Christmas Eve or New Year's Eve. The instructions on how to contact our support will be provided after a license delivery. Help with technical problems: If the software does not perform as expected or if there is an issue in the results, then our support will help the user solve the problem or will initiate the bug-fixing process. The bug fix can be distributed to user non-publicly before the next official release. Help and advice about the licensed product: If a user would need a specific functionality which cannot be found in Help or other materials, then our support will help the user with where to find it and how to use it. Basic workflow help and advice on where to find more information about how to solve a specific task. Product training: If a user cannot work with the software based on the available help and tutorial materials, and the support would spend too much time on directing the user in the right direction, then the user shall be advised to get a paid training. Expert consultation: If a user cannot design a capture scenario properly or their capture scenario gives bad results and the problem is not in the software but in the user's approach and if the support would spend too much time on directing the user in the right direction, then the user shall be advised to get a paid expert consultation. If a user is interested in buying a license, the specification of the respective license types and names, information about the price, as well as information about the license validity are mentioned at the company's website. The user chooses the software licenses. The customer is eligible to make a contract about the license provision (onwards just as ‘the contract’). A user confirms that the provider has clearly enabled them to acquaint themselves with these business conditions before confirmation and sending an order. By sending an order the user agrees with these conditions. The user sends their proposal to make a contract by placing an order. The contract is concluded when the user's order is paid. Any order is not binding on the provider until accepted by the provider. Orders are placed online at the provider's website. Order details are written in English. A user orders a license by clicking on the 'Send Order', or 'Pay Now' button in the Buy section of their MY Account. It is necessary to register and log in in order to be able to start the order process. The license(s) is(are) created after the order payment confirmation. Licenses are listed in the Licenses section of the user's MY Account. The invoices are listed in the Invoices section of MY Account. After the order is made by the user, a confirmation email is sent to the customer or the customer is redirected to the payment system. Way of delivery: The provider ships no physical products. All products are supplied in electronic form. Any details necessary to enable a customer to download and use the acquired product (including license keys or access details, where applicable) can be found in the user's MY Account, this document or the software's Help. Time of delivery: The license(s) is(are) created after the order payment, no later than 24 business hours after the payment. If it is not, then the user must contact the provider and the provider will create the license(s). The installation file of the latest version of the product can be downloaded directly from MY Account. The price of the RealityCapture products is laid down based on the current price list published at the provider’s website. The license price is being shown during the order process directly in the order. Additional tax may apply. The provider sets prices in euros unless stated otherwise. The provider reserves the right to change the price list ex parte. An invoice for the customer is issued no later than 5 working days since the payment reception, or upon the customer's prior request with the standard due date 30 days since its issue. An invoice can be downloaded from the Invoices section of the user's MY Account. If the customer desires to be sent the invoice also via a postal carrier, they can ask for it by sending an e-mail to the provider. The invoice shipment expenses bears the provider. The payment can be made in different ways and through different retailers and resellers. The payment charges (to the benefit of the payment provider as the third party) bears the customer. The invoice contains all the requirements of the taxation document. It can be issued by a retailer or a reseller. Due to the specific nature of the software products, the provider does not guarantee nor claim that the functions contained in the software will suit the customer’s requirements or that its operation will be flawless. The provider does not bear the responsibility for non-functionality or unusability of the software as a result of wrong use or a combination of influences of technological / software equipment or harmful software. The software, all accompanying files, data and materials, are distributed "AS IS" and with no warranties of any kind, whether expressed or implied. The user must assume all risk of using the software. Due to the specific nature of the provider's software products, the provider recommends customers in case of problems to contact first the customer support department, and then, not until the problem is not solved to the customer’s satisfaction, to contact the sales department. In the event of breach of the warranties stated in these business conditions, a customer is entitled to (a) the fault of the RealityCapture product (software) to be removed, (b) the software to be delivered without the fault, (c) the faulty installation file to be replaced by the faultless. The right of responsibility for faults is applied directly at the provider’s company address (Capturing Reality s.r.o., Syslia 46, Bratislava 821 05, Slovakia) by sending a postal item. The provider is obliged to dispose of the claims in 30 days since the day of its exercise. The conditions and procedure for claims processing will be used appropriately also when solving the customers’ suggestions and complaints. A customer is entitled to withdraw from the contract in 30 days since the provider’s license order confirmation on the basis of which the license order will be cancelled. The contract withdrawal needs to be sent as a postal item and must contain the customer’s data which were used in the order, as well as the login name. If an invoice has already been issued to the order, the request must contain the invoice number. In this case a credit slip to the invoice will be issued. If the ordered license has already been paid for, the provider will refund the customer, who does not have the role of a consumer, within 14 days since withdrawing from the contract by bank transfer to the customer’s account, which is a mandatory item to be filled in in the contract withdrawal. In case of a consumer, the payment is returned within 14 days since the contract withdrawal reception day in the same way as the consumer used for the payment, unless the consumer and provider explicitly make an arrangement that the refund will be made in another way. The expenses associated with the refund bears the provider, also in the case of a mutual agreement on a form of refund different from the originally made by the consumer. In case that the contract is withdrawn by a consumer, they can complete the sample form for contract withdrawal available at the provider’s website. The completed form should be sent to the provider’s company address (Capturing Reality s.r.o., Syslia 46, Bratislava 821 05, Slovakia). A consumer is also entitled to send a contract withdrawal to the provider also in a different legible and intelligible form, for example by a postal item without the necessity to fill in the sample form for withdrawing from the contract, as long as the objective / will of the consumer to do so is clear from the postal item. No later than in 3 business days since the contract withdrawal reception, the provider will send to the customer an e-mail confirming the reception of the respective withdrawal. Equal to the 'Terms of license' of this document. The customer declares that they had acquainted themselves with these business conditions before the order completion and dispatch and that they agree with their content. Orders placed by a customer with an external provider's distributor are subject to terms and conditions of acquisition set forth by the distributor. The provider and the customer declare that they fully accept the long-distance communication – particularly the electronic form of communication via electronic mail and the Internet network as valid and obligatory for both parties.